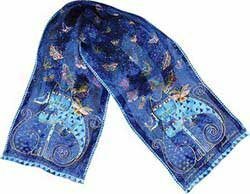 The Indigo Cats Cat Laurel Burch Designer Silk Scarf. This beautiful silk scarf measures 53 inches by 11 inches, and adds the perfect touch of whimsy to any outfit. A fantastic gift item for any occasion.